Few people were outside Saturday unless they had a snow shovel in their hands. Laura Wilbur, a Southport resident since 1968 who was busy shoveling out her Main Street driveway, said the blizzard from Friday overnight into Saturday was comparable to the famous Blizzard of '78. "I think it was probably about the same," she said. 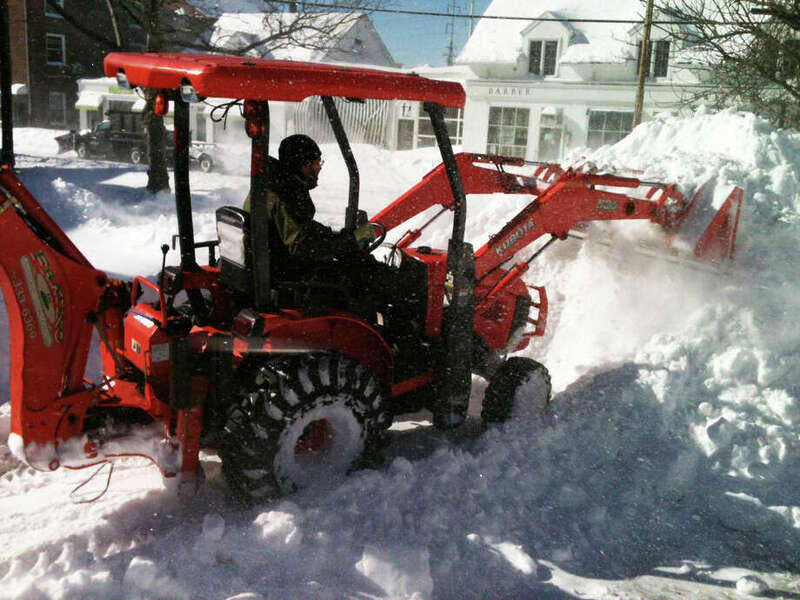 Wilbur said she thought Fairfield's Department of Public Works crews had done a great job clearing snow from streets. The local snowfall was estimated between 2 to 3 feet. K. Thomas Fuller, who also was shoveling out a driveway on Main Street, said he recently arrived in Southport from the Midwest and wasn't fazed by the huge snow dump. "This looks like every other storm" out there, he said. "We don't talk about it, we just get busy and shovel." Alison Danzberger, who was walking her dog Sasha along Chester Place and Main Street, said she's lived in the Southport section of town since 1985 and doesn't recall this much snow previously. She said she didn't know how she was going to get her car out but added it didn't really matter because the roads weren't fit for cars yet. Danzberger said she owns Then Again, a consignment store on the Post Road in Westport, and couldn't open it because of the heavy snow. "It is beautiful," she said of the snow. "We just have to all slow down and enjoy it because what else are you going to do?" Danzberger, whose dog is a Husky, quipped, "We need a sled." Louis Fratino of Fairfield, busy plowing snow from a parking lot in Southport Village, didn't recall such a large amount in his lifetime. "This is pretty much the largest amount," he said. "The biggest thing was last night from 11 on ... That's what got us by surprise. It accumulated so fast." Justin Bechtold of Southport, walking along Pequot Avenue with his fiancee, Elizabeth Wenzel, also of Southport, said, "It definitely is the most snow I've ever seen from one storm." Bechtold said he was most concerned about getting to work Monday morning. "Hopefully, the plows will come around; clear roads by Monday morning," he said.